It’s a classic method that’s been around for decades and is just as effective as it’s always been. 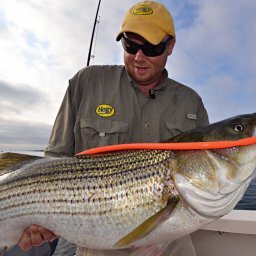 The Cape Cod striper fisherman’s collection of tackle would be incomplete without at least a couple wire line trolling outfits. 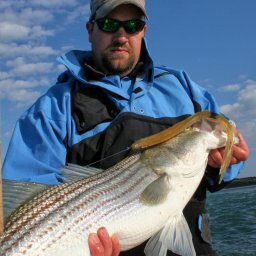 This striper was taken while fishing a tube and worm on a wire setup off of Sandy Neck. A typical wire line trolling outfit consists of 50-pound test Dacron backing, 300 feet of 50-pound test Monel stainless wire line, topped off with a 6-foot shot of 50-pound mono connected to the wire with an Albright knot. A wire line jigging rod is often fiberglass, which is softer and more forgiving with the wire line. Carboloy guides are essential as they won’t be grooved or split from the wire line moving through under pressure. Hands-down the most popular real is the Penn 113H 4/0 Senator. When I do fish wire, I fish with a smaller outfit and with shorter amounts of wire. Shorter Wire: I grew up working on a boat that took parties of 12 out jigging for stripers and blues. We had 4 jiggers on the back. It was a lot to manage and 99% of our anglers were brand new beginners. As a result, we fished with shorter wire. (125 feet) to avoid epic tangles. Over time, we figured out we could fish just as well as the longer lines with some strategic maneuvering. We’d make shorter passes, a series of turns, take boat out of gear, and periodically let out more line and bring it back in. As it turns out, it was more productive to fish deeper as anglers had more energy to jig, and we were far more tactical about the fish we were catching. 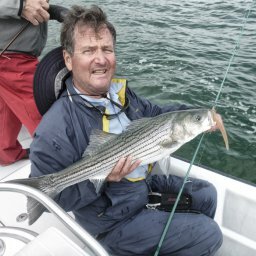 Shorter Trolling Rod: These days I find myself fishing with a very short outfit, say 5 ½ feet. The shorter length makes the rod both lighter and more manageable to jig with. The shorter rod also helps keep the bait a little deeper when the rod is in the holder. I rarely troll wire in more than 40 feet of water so I have no problem getting down with the outfit mentioned above. 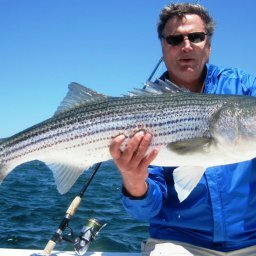 I’m also of the philosophy that if I need to fish in water deeper than 40 feet, trolling seems too much like work and I move to a new method. Always keep your thumb on the spool when letting line out. Be careful of the knot between the wire and the leader, if it catches on a guide or the rod tip it can cause back lashes. Check your knots between the backing and the wire, and the leader and the wire frequently and re-tie as needed. Trolling and jigging can loosen even the best tied knots. If you’re loading the reel with 300 feet of wire, mark each 100 feet with a permanent marker. This way you can accurately gauge how much wire you’re deploying depending on the depth of the water. 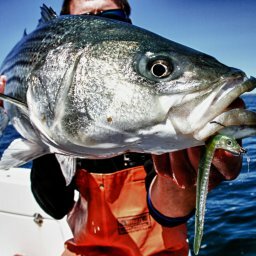 When jigging, ALWAYS keep tension on the wire. Slack line = lost fish.